The SS316 (Stainless Steel) BF Cubis coils (also compatible with the JoyeTech eGo AIO) , not only are they compatible with temperature control mode, JoyeTech has innovated to allow these coils to be used with other power settings such as VW as well as TCR mode. Two SS316 coils have been designed to suit two different vaping needs. The 0.5Ω heads work great for direct lung inhales for a large volume of vapor and the 1.0Ω SS316 heads work well with mouth inhales for a smooth and gentle draw. With the Cubis BF Clapton coils, these atomizers provide great flavor from the considerable surface area and design of the wire being used. Among the great flavor from surface area, these coils allow for low wattage vaping to conserve power in VW mode. The BF RBA coils are the way to go if you want to customize the way you vape your Cubis. Users are able to rebuild and replace their own coils to cater to their own variety of needs. 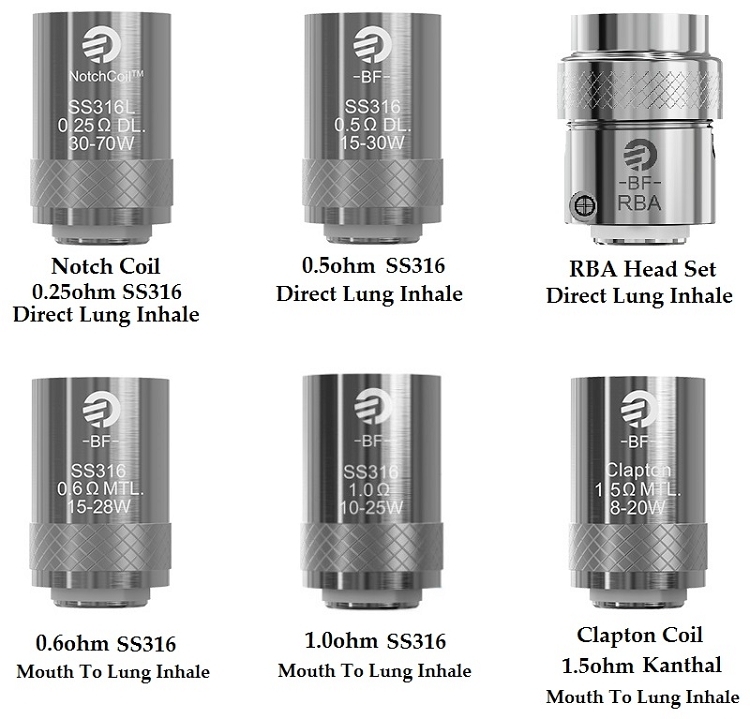 With the possibility of building the BF RBA vertically or horizontally, not only do these heads provide option but they also provide a more economical way to vape. For the best performance with the eGo AIO, JoyeTech recommends using the 0.6Ω BF coil heads.